On the road to Chennakeshavapura, a helpful sign on a stone identifies the village as CK Pura for short, but that message is lost on many illiterate residents. For them, reading and writing matters less than channeling enough water to their fields and growing enough peanuts to ride out the drought years. In 2007, Swiss computer scientists and Indian agricultural scientists offered to install wireless sensors in the peanut fields at CK Pura and collect data the farmers might find useful for improving their yields. There was just one problem: few of the farmers could read the recommendations. Now the farmers are testing smart-phone software designed specifically for illiterate users. An early version communicated valuable information about the farmers’ crops, but the latest version should also let them send and receive text messages, using icons that are translated into words. The work could lead to other tools that give illiterate people elsewhere access to mobile communications. Computer scientist Hendrik Knoche at the Swiss Federal Institute of Technology in Lausanne designed the new smart-phone interface for the farmers together with P.R. 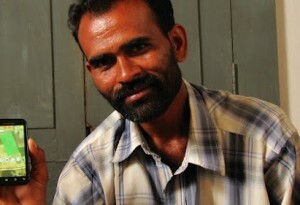 Sheshagiri Rao, a farmer in CK Pura who once worked as an agricultural scientist elsewhere in India. Back in Lausanne, Knoche challenged his students to design a text-messaging application for illiterate users of touch-screen phones. The result, easySMS, lets users compose their own messages by highlighting single words from incoming messages, playing them aloud, and copying and pasting them into new messages. The application also contains a small dictionary of common words and phrases. Early mobile devices required users to navigate through nested menus several layers deep to do something as simple as change the clock or send a message. Some illiterate users could memorize keystrokes and get certain things done, but these interfaces were typically a major impediment, as TR35 innovator Indrani Medhi, of Microsoft Research in Bangalore, has shown in numerous studies. By switching to touch-screen devices, which Knoche saw selling for as little as $50 in CK Pura, illiterate users could use more recognizable icons instead of menus, and wouldn’t need to memorize as many steps to control the devices. Mobile network operators in India, which are now looking to rural regions for growth, probably agree. Worldwide, there may be around 793 million illiterate people.